A unique history and record of the final underwater resting places of Cunard ships spanning two centuries. 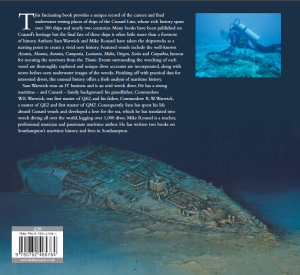 This fascinating book provides a unique history and record of the final underwater resting places of ships of the Cunard Line, whose rich history spans nearly two centuries. Authors Sam Warwick and Mike Roussel include a detailed history of each vessel leading up to the time of its loss, including Ascania, Alaunia, Aurania, Campania, Lusitania, Malta, Oregon, Scotia and Carpathia, famous for rescuing the survivors from the Titanic. Events surrounding the wrecking of each vessel are thoroughly explored and unique accounts are incorporated from divers who have explored the wreck, along with never-before-published underwater images of the wrecks. In addition to 18 diveable wrecks the book includes accounts of 66 other losses such as the Queen Elizabeth and Atlantic Conveyor. Finishing off with practical data for interested divers, this unusual history offers a fresh analysis of maritime history. Shipwrecks of the Cunard Line has 168 pages and contains over 200 images, the majority in colour. The front cover features the wreck of the Malta, lost of Cape Cornwall in 1889. The painting is by Robert Lloyd. The photos are exceptional, the text crisp, well-researched and interesting. 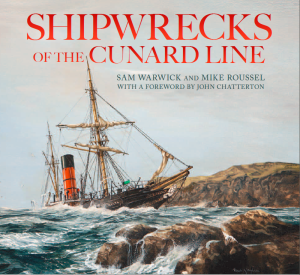 Sam Warwick (whose father and grandfather were Cunard commodores) and Mike Roussel have written a book that’s full of history and the excitement of exploration. Their book is highly recommended.